You are here: Home / News / Loyalty to Black Barbershops. (ThyBlackMan.com) There was a long period throughout the 2000s and most of this decade where I simply grew my hair out. Ten years roughly. I used to head up to the barbershop regularly. This was the same one I went to since I was four or five. When you’re really young, you might not pay full attention to conversations. There is a lot of waiting to get your hair cut. It could be an ordeal that really ate into your weekend plans of being a kid. Then you get a little older and you might pay more attention to the discussions around you. If you’re not a big sports person, some of it will be just like being that kid who just wanted to enjoy his weekend. The joking and the commentary on whatever was on television was one of my favorite parts of going to the barbershop. The first time I called it quits was slightly after high school. I was extremely impatient and hated waiting an hour or hour and a half. The discussion was there until everyone started watching television. Then I just sat there waiting: number eight with three and a half active barbers. When my brother began cutting hair and doing edge ups I just stopped going. Time was back in my hands. It was great. Once he left for college, I began heading back and that’s when I was fully taking in the conversations around me. It’s safe to say that I wasn’t with the majority of the things being said. Note, this was a shop being ran by old heads. There are times when you get truly valuable nuggets of knowledge from old heads. These are those timeless lessons that apply regardless of the generation or decade. Then you have situations like this. Viewpoints that were outdated or would’ve been at home decades earlier—to put it nicely. I would stop going to barbershops and just grew my hair. I considered going to a new barber, my neighborhood had several of them but at that time I only trusted two people with my hair. Having a barber for years is a thing—especially if you grew up with them. You even get to know the other barbers with chairs but you still have that particular one you’ll wait for. And you know what, the other barbers tend to understand that. Hell, they might be the same way when they get their cut. Even though my own viewpoints changed and I’d grown out of arguments ending with “See you young folks are X,” I still had loyalty to this guy. His edge ups were very crisp and the chairs were industrial strength. I eventually found a new shop with a better atmosphere. Not only that but the guy who runs it gives good advice, keeps up with politics, and I don’t have to pay cash. Wild, it’s almost like this place belongs in 2019. It’s not all roses. The wait is roughly the same so getting there in the morning isn’t optional but mandatory. That said, returning gave me something I’d been missing for years. There’s a social element that comes with barbershops, beauty salons, local food joints, and so on. That same social element can be toxic and annoy the hell out of you but it can also be welcoming and enjoyable. Barbershops tend to sit on the enjoyable. This is especially true if there isn’t a big generation difference or it’s welcoming to different generations. My old shop catered to all generations but when discussion began, some of us were froze out. It wasn’t entirely down to not being able to relate but there are some dated viewpoints. The new shop has its share of generation arguments but they’re handled better than when it was most costumers being old heads, all of the chairs but one being old heads, and the younger folks chilled at the far end of the shop. Loyalty to a barbershop can be great and to a degree, these barbers earn that trust by not f’ing up your hair. However, don’t let that loyalty turn you of them if you leave or have you still showing up at the same one just because. The search can be tedious but there are other shops out there that won’t try your patience. 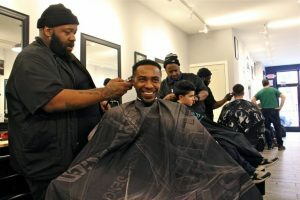 You can be loyal to Black barbershops without being loyal to a particular one.